Unless you are Finnish, you are probably asking, “what is a Karelian Pie?” I never knew until I went there and had them for breakfast multiple times. Eaten warm, and slathered with not-so-vegan egg butter, these savory rye and rice pastries are so good. In Finland, I saw them in one format: plain. Which is absolutely delicious and when I make them now, I do half plain and half in some other flavor. Because I am not Finnish, I guess it’s ok for me to riff on the original. If you are a Finnish investor and would like me to come and live in Helsinki, and run a Karelian pie bakery that isn’t afraid to take these classics to a new level, please contact me and we can talk. I have broken from tradition here in two ways. 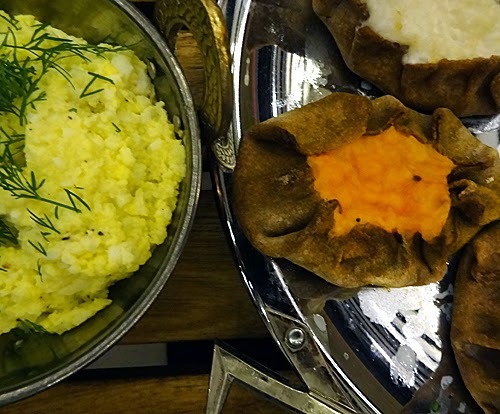 In Finland, Karelian Pies are filled with a porridge of milk, salt and short grain rice. The first time I made these, I made two different kinds, one with cow’s milk and one batch with coconut milk. I am not sure why, but it was virtually impossible to tell which one was which. This is good news for vegans and people avoiding dairy. The other liberty I took was to stir boiled, pureed carrots and a bit of oil tempered with cumin seeds in to half of the finished rice porridge before stuffing the pastries. This resulted in a creamy, slightly sweet cumin laced pie, which I have to say I like even more than the original. One thing I have learned about Karelian Pies: the flavor must be simple and pure so as not to overpower the subtle flavor of the rye flour crust. A word on rye, gluten and other ancient grains. I have been floating on a sea of information and observation for years now, trying to decipher and filter out what works for me in regards to what I eat, and how it makes me feel, both psychologically and physiologically. The island I have landed on in recent months is one that I like, and think I will stay here for a while. I do not have celiac disease. And I may or may not have a sensitivity to gluten, as I sometimes notice if I eat too much wheat, or believe what my allergy blood test tells me. But I often wonder if it is not just the super-sized wheat mutant monster that scientists have created to satiate America’s gluten addiction that some of us are reacting to? Perhaps the more delicate, sensitive gluten found in ancient, unadulterated grains such as rye, spelt, kamut and barley are more digestible? I am no scientist, and I am not going to cross-reference my readings here. But this is where I am at, and I have been baking a lot using these wheat alternatives, which have gluten, but my body seems to know what to do with. I was so healthy and happy in Finland, as if my system was finally in its nutritional homeland. Don’t even get me started on the bread there. The rye bread alone was worth the trip. Back to Karelian Pies. This is a food you are unlikely to see outside of Finland very often. Luckily, they freeze well, and hold together well enough to pop into the toaster or toaster oven for a quick breakfast. Although whenever we make them here, they don’t make it to the freezer at all. 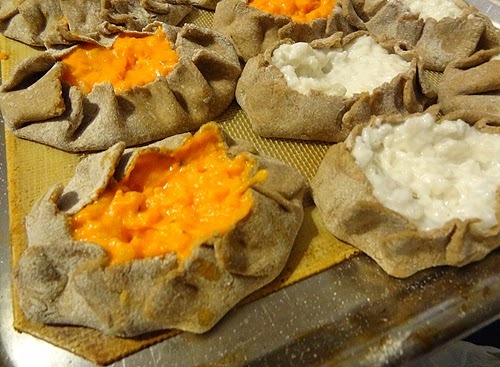 Karelian Pies are typically eaten with egg butter (I love egg butter). It is basically hard boiled eggs mashed up with room temperature butter, and this is the part of the puzzle that I haven’t tackled for the vegans, as I do eat eggs. If you eat eggs but not dairy, like my man, you can make the egg butter with coconut oil and it is just as good as the one made with butter. This is one of those cooking projects, like tamales, that is more fun done with friends and wine and when you have time to cook. Make lots, share with everyone, eat a bunch, and hopefully you’ll even have enough left over to freeze. If you are inspired to make some other flavor, please share…these things are ripe for experimentation! 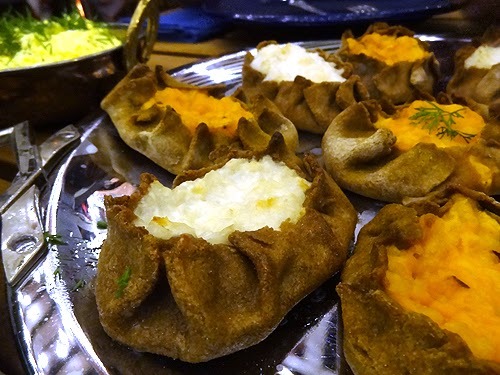 Here is a good recipe for traditional Karelian Pies, and the one that I adapted from. Make the porridge. Boil the water in a large pan. Add the rice and cook for a couple of minutes, then add the coconut milk and bring to a soft boil. Simmer for about 45 minutes to an hour, until it is a thick, creamy porridge. Add salt and let cool completely. Make the carrot-cumin element. Steam or boil carrots until soft. Puree in blender. In a small pan, heat the coconut oil until it spatters when you drop a single cumin seed in there. Once ready, temper the oil with the remaining cumin seeds, allowing them to pop, toast and spatter for about 15 seconds. Remove from heat, stir into the carrot mixture. 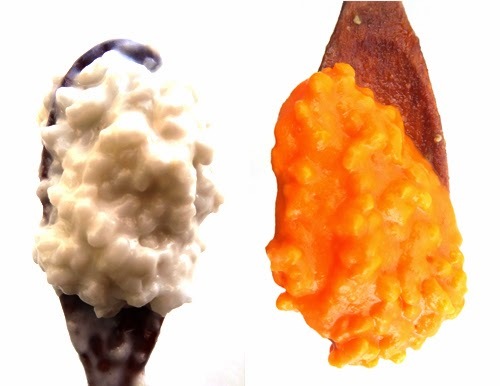 Divide the rice porridge in half, and add the carrot cumin mixture. You will now have two flavors of Karelian Pie! Make the rye dough. 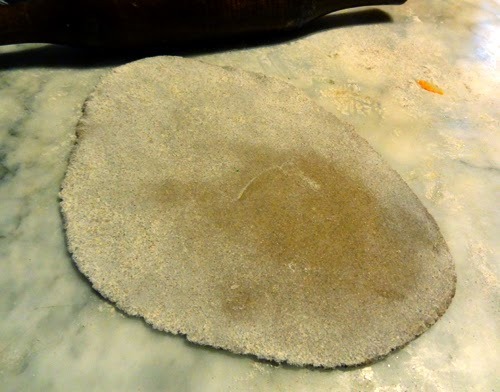 Combine water, salt and 500 grams rye flour in a bowl. Continue to add flour until the dough can be kneaded and handled. Cut the dough into quarters, and then roll each quarter into a cylinder. Divide each cylinder of dough into ten equal portions and flatten each portion to make a round disk. Cover the disks with cling wrap to avoid drying. Make the pies. Roll one disk at a time into a thin (2-3mm thick) oval, spread couple of tablespoons of porridge onto the disk, and wet the edges of the disk with water using your finger. Pinch the sides together around the disk, creating a little basket using your thumb and index finger. Bake the pies. Place the pies on baking trays lined with parchment paper and bake in a preheated oven (425F) for 15-20 minutes or until the tops are slightly browned. Heat coconut oil, coconut milk and water in a saucepan. Dip each pie in the hot mixture to soften. Place on drying rack for 5-10 minutes so the milk does not make the bottoms soggy. Use a fork to mix the eggs with soft butter and serve the pies topped with this mixture. These pies can be frozen (minus the egg butter).